With its convenient tools for helping you create a budget and manage your expenses as well as a 0% introductory APR, the Wells Fargo Platinum Visa Card can be a perfect option for many people. Should you decide to apply for such a card, we’re here to guide you through the process of filling in and submitting an online application. 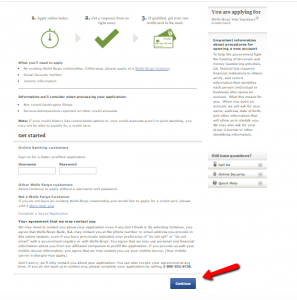 Step 1: Go to the card’s main page and click on the ‘Apply now’ button. Step 2: If you already have a Wells Fargo online banking account, enter your username and password for a prefilled, faster application and press ‘Continue.’ If you don’t have a username and password, you can apply by clicking directly on the ‘Continue’ button on the bottom of the page. Step 3: Enter your personal details, including: first name, middle initial (optional), last name, suffix (optional), home/permanent address (as well as your city, state, Zip code), date of birth, home phone number, email address, social security number, citizenship. Choose also a security word. Step 4: Introduce your financial details, such as your housing status, monthly mortgage/rent payment, employment status, additional income sources and financial affiliation. Step 5: Customize your card options by adding another previous card to be associated with your new one and choose if you want your balances from other accounts to be transferred to your new account (optional). 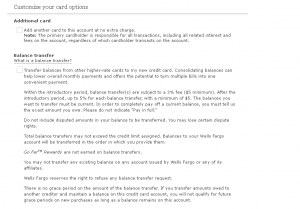 Step 6: Read and review the terms and conditions associated with the Wells Fargo Platinum Visa Card and agree to them by checking the required box. Click ‘Submit’ to send your application. Q: What does Wells Fargo Online stand for? Wells Fargo Online stands for Wells Fargo's online banking system. 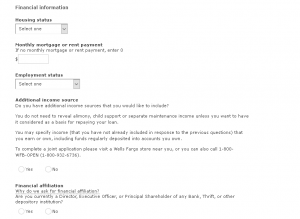 It allows the clients to securely access and manage Wells Fargo accounts, pay their bills or view their statements. You do not have to make an account if you already have a Wells Fargo Online profile, because your credit card account will be automatically added to your profile. If you want to sign in, you will need your Social Security Number, Wells Fargo Bank, N.A. credit card account number, and email address. 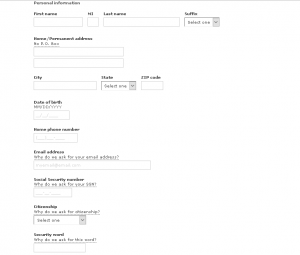 The sign in process includes some questions and the creation of a username and password. Wells Fargo Online is accessible from your computer, mobile device, or tablet wherever you have the Internet. You can use it for making payments, set up automatic payments, meaning that you can choose to pay the minimum payment amount, your balance in full, or a specified dollar amount. Q: What does it mean “float” related to the credit card account? Float is the period of time, between the purchase and the transactions post. This might happen when the purchase is done, but it needs a few days for the charge amount to be added to the balance of the account. Q: When buying in Wells Fargo store, do I need my PIN number? A PIN number is necessary if you use your card for cash advances at ATMs or to make purchases at automated kiosks, when traveling abroad. Otherwise, you do not need a PIN.